For the past month or so I’ve been making taco salads on repeat although most of them are dialed-down versions of the one I’m sharing today. This scaled-up salad is what I consider a fancier version of the “everyday taco salad”. “Everyday” being a salad made with ground beef seasoned with taco spices from a packet, tossed with pre-shredded cheddar cheese and tossed with greens and bottled dressing. 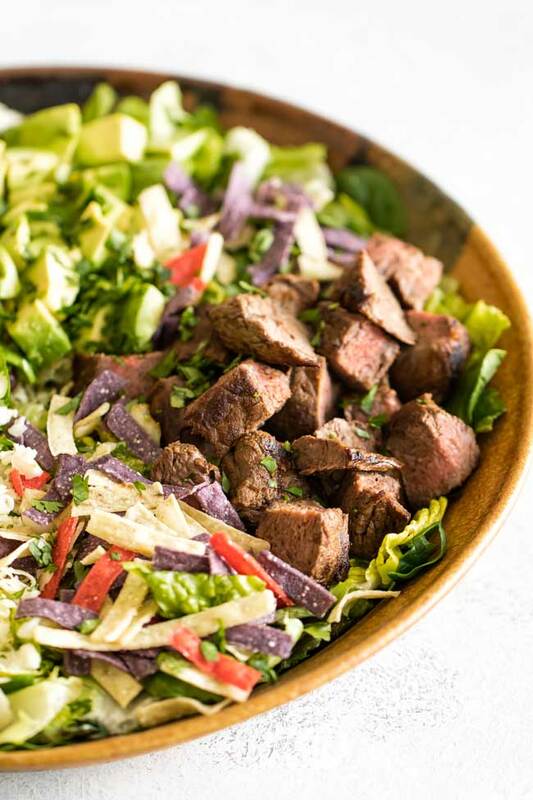 If the everyday taco salad is like a pair of sensible weekday shoes this steak version is like those kicky boots that might kill your feet, but are so worth it for a Saturday night out. 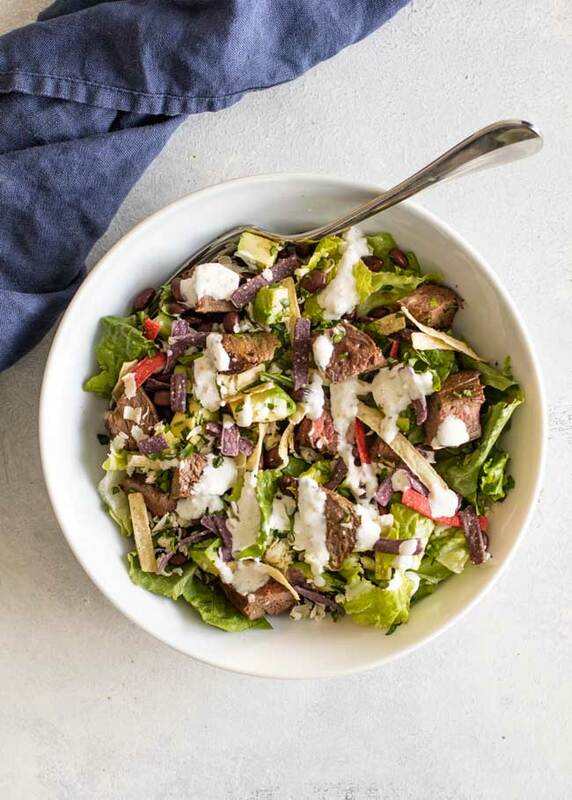 Although, unlike those spiky-heeled boots, this steak taco salad won’t cause you any pain and is easy to make – it just takes a bit longer than my old stand-by tossed-together weekday version with a few extra accouterments that make it feel a little more grown-up and flashy. 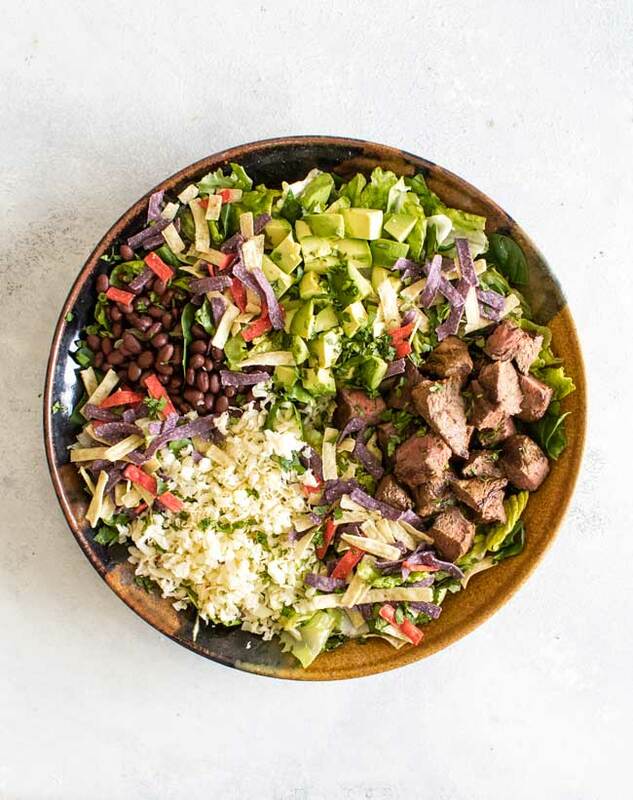 The biggest upgrade between the everyday taco salad and this fancier one is sirloin. Instead of crumbled ground beef, I marinate an 8-ounce sirloin steak in some olive oil, chili seasoning, and lime juice and pan sear it until it’s still a little pink inside. Let it rest and then cut it into bite-sized pieces. 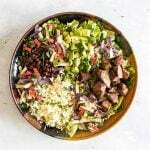 The rest of the salad is an assemble and toss situation albeit with a little more care and thought then my weekday taco salad gets. I like a mix of crispy romaine with tender spinach as the base of the salad. From there add some diced avocado, shredded pepper jack cheese, and some black beans. During the week, when I cobble together the more basic salad, I might just top it with some broken tortilla chips from the bottom of the chip bag. But for this upgraded version I like to sprinkle some little tri-colored tortilla strips and (not paid to say this, btw) I love the Fresh Gourmet brand, which I think is sold at most grocery stores. They just feel a little fancier and they add the perfect amount of crunch. The dressing is only slightly more difficult than opening a bottle – just mix together some sour cream, store-bought salsa verde, and lime juice and, voila, the dressing is made. 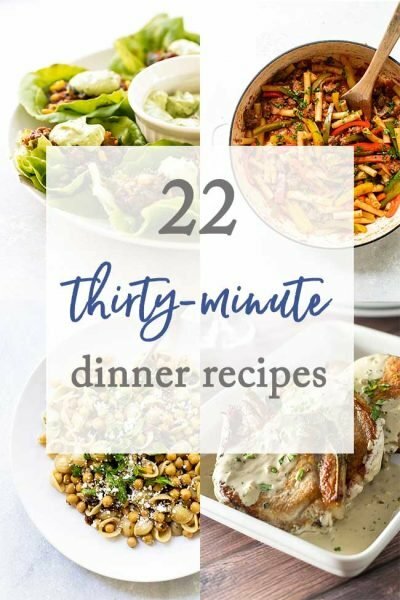 This recipe makes two very generous servings. Drizzle the dressing over the top, serve it with some cold margaritas and a bowl of chips and guac on the side and dig in. 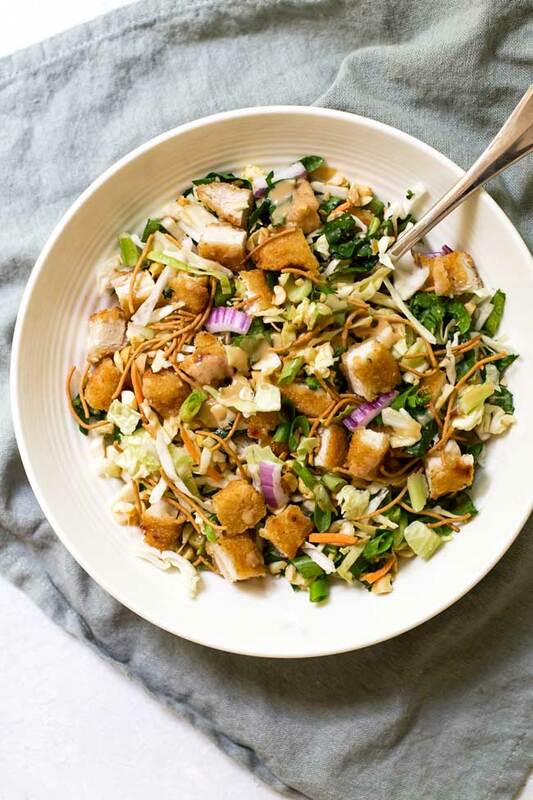 Crispy Chicken Salad with Peanut Garlic Dressing |This restaurant-inspired salad has crispy chicken, crisp greens and crunchy rice noodles that are tossed in a peanut-garlic dressing. Plus, it’s packed full of short-cuts so you can have it ready to go in no time! 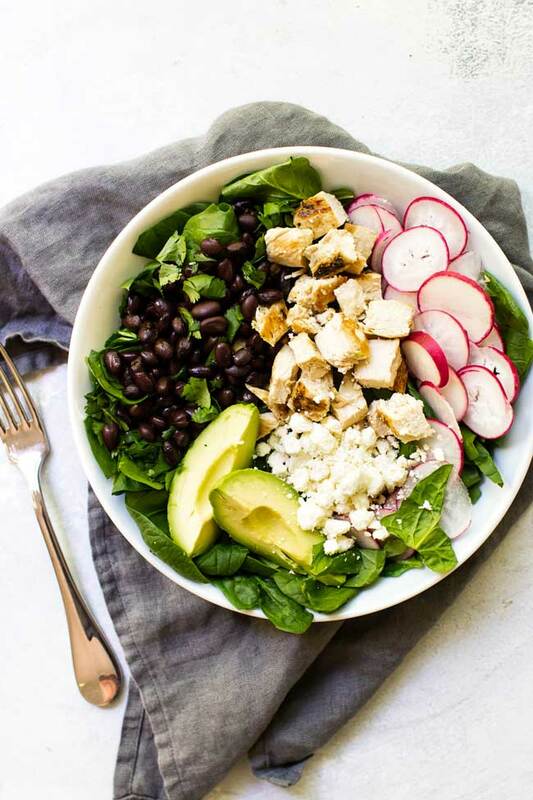 Chicken & Black Bean Spinach Salad | This salad is a lunchtime power boost that will fuel you through the afternoon. 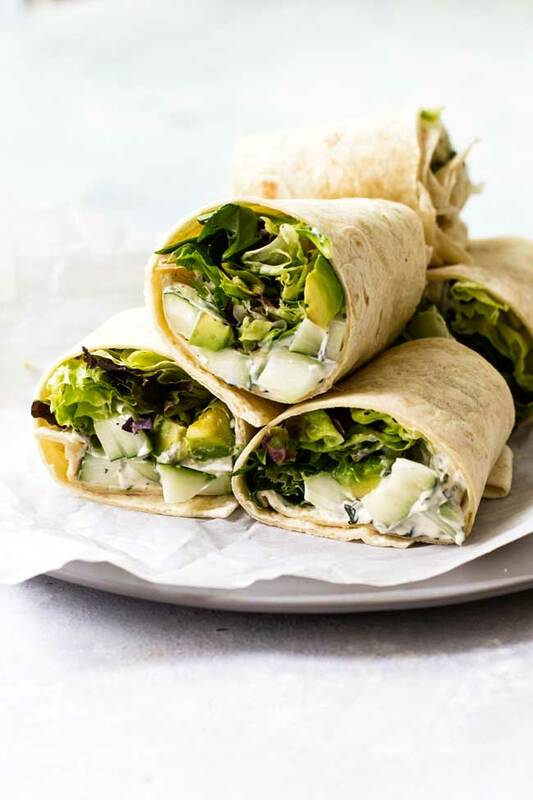 It’s packed with veggies and tossed with a simple garlic-lime dressing. Prep the ingredients ahead of time for easy weekday lunches or dinners.